The 8x8" Inspiron Zino HD's space-saving design fits anywhere in your home.It's a full-featured HTPC that's portable enough to move from room to room as your family's needs change. The brushed black metal finish with standard brushed black metal lid complements any decor. Or, you can choose from one of the three available, removable color lids: mercury silver, peacock blue or tomato red. Don't let the compact design fool you. The Inspiron™ Zino HD (high-definition) HTPC is packed with powerful features to meet your family's everyday computing needs and entertainment desires. It features VISION Technology from AMD which allows you to experience vivid web and video content, sharp photos and crystal clear music. Fast quad-core processor for incredible performance with games, applications and multimedia. Experience smooth HD viewing with up to 1GB ATI Mobility Radeon™ HD 5450 discrete graphics. With options up to 1TB* of hard drive capacity, your photos and videos are easy to manage and view. Plus, the 2 eSATA ports make connecting an external hard drive quick and easy. 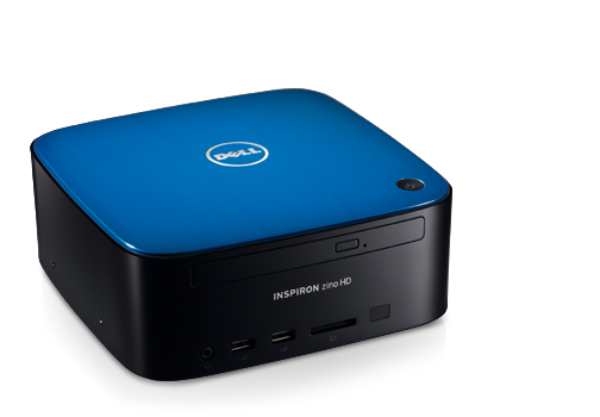 The Inspiron Zino HD HTPC will provide hours of multimedia fun for everyone in the family. Hook up the Zino HD to your TV and transform your media center with streaming movies from the comfort of your couch. And enjoy breathtaking visuals with the optional Blu-ray™ player. With 4 USB 2.0 ports, a 4-in-1 media card reader, an HDMI 1.3 connection and optional 802.11n wireless connectivity, you're set to connect to your digital world (wireless network required). Immerse yourself in crystal clear sound with integrated 2.1 Hi-def audio and options up to THX 7.1 audio. You can personalize your new (PRODUCT) RED™ Zino with any of the three eye-catching color options: Tomato Red, Peacock Blue and Mercury Silver.